John McAnulty of Socialist Democracy (Ireland) highlights the significance of the recent Ulster Unionist challenge to the ‘Peace Process’. When a Sinn Fein commemoration march was barred from the small town of Castlederg in August, despite Sinn Fein’s role as junior partner in the local administration. Gerry Kelly expressed their frustration: “There are two narratives in this society, and both need to be equally respected”. This belief is the central focus of Sinn Fein’s current ideology. Sometimes expressed through the metaphor of a journey, it suggests that both they and the unionists are making equal concessions in order to arrive at a “post conflict” society. The ideology has been used to justify the Shinners constant evolution to the right and acceptance of a colonial and sectarian settlement. Now the Unionists and Loyalists are mobilizing to tell them this is not the case. Their constant Orange sectarian provocations, frequently led by members of paramilitary death squads, are all legitimate. Attempts by Sinn Fein to commemorate their dead are “promoting terrorism” and therefore illegitimate. Nor is this some wild-eyed fringe of unionism. First Minister Peter Robinson was quick to step forward and denounce the march. The British, in the form of the Parades Commission, moved to ban the march from inside the town, despite desperate attempts by Sinn Fein to conciliate unionism and suggest an uncontroversial route. The final touch was a formal statement by British Secretary of State Theresa Villiers supporting the unionist position. The outcome was that loyalist marches can move freely through the centre of Castlederg. Republican marches are banned. As one local Sinn Fein member remarked, this was the situation in 1950, before the emergence of the Civil Rights Movement. The same pattern could be seen at other marches. A civil rights march through the centre of Belfast was approved by the Parades Commission, who then gave carte blanche to loyalist groups to assemble and block its passage. The mass riot that followed forced the parade to divert. A police force that, during the troubles, had beaten back civil rights marches of 100,000 from the city centre was unable to prevent a few thousand loyalists from taking over the centre with the slogan: “No Fenian feet on Royal Avenue!” There were some sharp conflicts between police and rioters, but there was also widespread dialogue and collaboration between paramilitary stewards and the police. The outcome of that dialogue was a manoeuvre well remembered from the past, when the police in full riot gear turned their back on the loyalist rioters and pushed a small group of republican bystanders up Castle Street and into the ghetto. The cops then cemented their collaboration with loyalism when they issued a statement saying that there had been no paramilitary involvement in the riot – in fact the paramilitaries and sections of the DUP were the main organisers and DUP minister Nelson McCausland issued a statement immediately following the riot saying that nationalist provocation was the cause of the violence. The police strategy was to stand in armoured suits and absorb the violence, use baton rounds when it became too extreme and photograph and arrest the most conspicuous troublemakers afterwards while remaining blind to the organisers. Mairtin 0’Mulleoir, Sinn Fein Lord Mayor and a chief proponent of an accommodation with Loyalism, was then assaulted while opening a park. DUP representatives whom he had just escorted around the Falls Road melted into the background and the DUP then issued a statement accusing him of provoking the violence. Even though there was advance notice of the protest, only a few community police escorted the mayor. State policy was underlined on 25th August when three demonstrations were held in North Belfast. A republican demonstration under the banner of unity of “Catholic, Protestant and Dissenter,” a Loyalist counterdemonstration, and a march by the loyalist Black Preceptory. The loyalist march proceeded without hindrance. The loyalist counter demonstrators were restricted to 20 – a ruling which, as a matter of routine, they contemptuously ignored and assembled in their hundreds. The Republicans, restricted to marching through back alleys and waste ground, disbanded after a short march on the main road, saying that they would not accept the label of second class citizenship contained in the ruling. The logic of the current situation is that a central concept of the Irish peace process: “equality of the two traditions” is dead in the water. The fact is that unionists and loyalists, politicians and paramilitaries, all stand united in defence of sectarian supremacy. Any deals must be seen to fit in this framework. Nationalist Ireland has a standard response – an appeal to imperialism to put manners on their unionist supporters. Sinn Fein has appealed in vain at Downing Street. Now they put their hope in US envoy Richard Haass who will be effectively rejigging the Good Friday Agreement yet again. Given the state appeasement of loyalism, a new fix will involve a quantum shift to the right. In reality Unionists will be open to a deal. Their view is that they have unrestricted rights. They are the Queen’s men on the Queens highway. Any restriction leads to a campaign to deny nationalists everyday rights. In the past, at Harryville, it was the right to attend mass. At Holy Cross it was the right of young girls to attend school. Nationalist Ireland will make such a deal. They have committed to the current settlement and the middle class have made many gains. On the other hand the unionists remain committed to a policy of sectarian dominance and many leading DUP figures remain willing to bring down the deal. In the face of their rabid sectarianism, only slightly moderated by Britain, Sinn Fein have retreated for many years. The most recent example was their retreat in Belfast City Hall from a motion condemning the loyalist attack on the Lord Mayor. The original Sinn Fein motion affirmed the right of the Lord Mayor to attend events in any part of the city to which he was invited, the new agreed motion, added the line formulated by the DUP “and to exercise the right responsibly”. A party willing to conciliate on physical attacks on leading members will have no difficulty giving ground on more general issues. The Sinn Fein spokesperson explained that this was necessary to create the right atmosphere to put their case to US representative Richard Haass. The main problem now will be to find some face-saving formula to save them embarrassment when they make further concessions. There remain two fundamental problems. The first is the sheer irrationality of unionism. This is especially the case when we consider that many contentious issues had been agreed in advance. A reduction in the number of days British flags flew from public buildings was agreed. The Orange Order was bribed to react peacefully to any march restrictions. Peter Robinson agreed a keynote conflict resolution centre at the site of the republican hunger strikes, humiliating Sinn Fein with endless restrictions, only to U-turn in the face of revolt in his own party. All of these measures would have secured the future of the Northern statelet and secured unionist dominance, but the first task is to placate the Orange monster on whose back the unionist politicians ride, so questions are being raised about the future of Peter Robinson and the local paper of the unionist middle class carries a dispairing “Wanted” poster calling for the emergence of a unionist leader. The other side of the coin is the emergence of resistance. 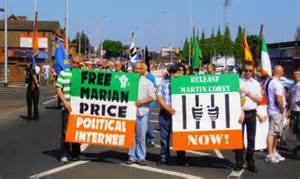 There has been a slow but gradual growth in republican groups paralleling the corruption and decay of Sinn Fein. Some sections remain militarist, but others are seeking an alternative political programme. The August Civil Rights march in Belfast was a way to measure their progress. The march struggled for five hours to push its way through loyalist rioters and police lines to reach its venue in Andersonstown. At the end it numbered 5000, and the numbers would have been greater if not for the long delay and the violence directed against it. The incident showed the simmering hatred between a mostly young and determined resistance and the old elite. At the moment the movement draws inspiration from the civil rights and republican struggles of the past. As the veterans of these movements collapse into the arms of imperialism, as the Irish state is occupied by the Troika, these themes will clearly not be enough. The hope is that joint action, joint discussion will rekindle the flame of the workers’ republic across Ireland.